Saturday 9 February at 2pm at the Asia-Australia Arts Centre. 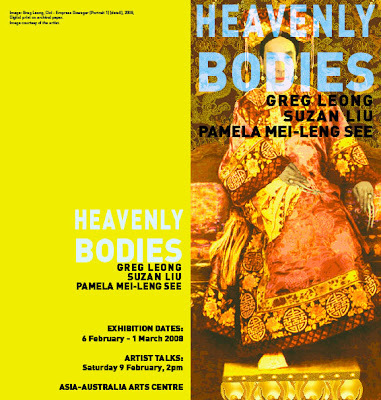 Heavenly Bodies brings together three contemporary Chinese-Australian artists: suzan liu, Pamela Mei-Leng See and Greg leong. Heavenly Bodies explores very personal experiences of being Chinese in Australia. Central to these artist's explorations are shifting notions of belonging, desire and the cultural effects of tradition and everyday contemporary life. The beginning of the lunar new year is a time for celebration and renewal; the question of how we see ourselves, as individuals and also as part of a group or a community is important. These artists ask us to consider the experience of being Chinese in Australia, both in an historical and contemporary context. Suzan Liu is a sydney based artist and has exhibited in artist-run spaces throughout sydney. For 'Heavenly Bodies' she has created two large-scale clouds which physically disrupt the architectural space of the gallery. Liu's clouds are inspired in part by the whimsical cloud forms found in Chinese traditional painting. Using foam and pillow stuffing and incorporating digital video projections, her laden clouds promise the possibilities of fantasy and new horizons. Pamela Mei-Leng See is a young Brisbane based artist. In 2007 she was artist in residence at the Pickled Art Centre, a foundry in Beijing. She has been exhibited in group exhibitions at the state library of Queensland; Queensland university of technology Art Museum and the Museum of Brisbane. In the tradition of the nian hua calendar posters her work in 'Heavenly Bodies' has been specifically editioned for Chinese new year. See invites visitors to continue the exhibition in their own environs by taking home one of the thousand papercuts she has had created. Her work employs the technique of Chinese paper cutting to investigate attitudes towards material renewal and economic prosperity. Greg Leong's work questions the origins of Australian identity and authenticity. Leong's garments are a sewn hybrid of both Australian and Chinese iconography whilst his digital prints laced with sordid beauty simultaneously reveal and play with the complexities of being both gay and Asian within the Australian imagination. Leong's works address the idea of 'putting on', 'dressing up' and the complex metamorphoses involving impossible changes of gender, sexuality and race and culture. Leong lives in Launceston, Tasmania. His work has been widely exhibited, including at the Museum and Art Gallery of the northern territory; Ten days on the island Festival, Tasmania; Queen victoria Museum and Art Gallery, Tasmania; Hong Kong Arts Festival, Hong Kong; Insitute of Modern Art, Brisbane. His work is included in both state and national collections throughout Australia including the Art Gallery of south Australia, National Gallery of Australia, Tasmanian Museum and Art Gallery, Queen Victoria Museum and Art Gallery, Launceston and the Museum and Art Gallery of the Northern Territory. "Welcome to the first issue of Poetry Macao, a publication of the Association of Stories in Macao (ASM). In this first issue we have a strong focus on Australian-Poetry – this is to coincide with the Australia-Macao poetry reading being held at the University of Macau on November 6 at the STDM auditorium in the university’s international library. The Australian focus also coincides with the inauguration of a University of Melbourne/Asialink sponsored Writer’s Residency at the University of Macau. Peter Bakowski – currently Writer-in-Residence here – will we hope be the first of many Australian writers to be hosted at the University of Macau. As well as featuring Bakowski’s work, this first issue showcases the work of established Australian poets who have strong connections with the East Asian region. Among these are Adam Aitken and Carolyn can Langenberg – also guests of the University of Macau for the November 6 poetry reading (and guest readers at United International College [in Zhuhai] on November 7). This first issue also features the work of Chinese/Australian, Ouyang Yu (currently Professor of Australian Literature at Wuhan University), and of Alan Jefferies, a poet long resident in HK and recently returned to his native Queensland." M/C - Media and Culture is calling for contributors to the 'citizen' issue of M/C Journal. M/C Journal is looking for new contributors. M/C is a crossover journal between the popular and the academic, and a blind- and peer-reviewed journal. In 2008, M/C Journal celebrates its 10th anniversary. To see what M/C Journal is all about, check out our website, which contains all the issues released so far. Citizen is a word we hear more frequently all the time, but it's also one whose meaning has never seemed less clear. "Citizen journalists" and "e-citizenship" initiatives are everywhere, but so are signs of crisis in democratic institutions and processes. The online tools used to promote new forms of active citizenship are products of an era where the traditional focus of citizenship - the nation - seems far less powerful and important than ever in the face of global flows of capital, communication and culture. The exhortations to pursue new forms of political engagement - like public affairs blogging and citizen journalism - can only be read alongside the mounting evidence of a widespread disengagement from politics. It's not clear whether or how democratic institutions can (or ought to) adapt themselves to the changing modes of participation. And it's also unclear whether the online spaces given over to political debate do anything more than further polarize our conversations. But can institutions and an increasingly diverse online public sphere change and adapt to one another to renew democratic participation? For this edition of M/C Journal, we're looking for pieces that weigh up the impact of new forms of political participation. We'd especially like to encourage articles that reflect on concrete attempts to increase participation in the political process, and to promote citizenship. Whether you'd like to reflect on an initiative you've participated in, or link theory with interesting examples of media practice and activism, we'd like to feature your contribution. Submit papers of 3,000 words in length to the editors at citizen@journal.media-culture.org.au. The Baylor Journal of Theatre and Performance (BJTP) seeks submissions for a special issue titled Performing Islam/Muslim Realities. Conceived as a collaborative project between the journal and the Arabic Theatre Working Group of the International Federation for Theatre Researach (IFTR/FIRT), the issue is guest edited by Hazem Azmy (U of Warwick, UK) and Marvin Carlson (Graduate Center of CUNY, US). The BJTP generally welcomes submissions on a variety of topics and approaches to criticism, including theatrical performance and theatre history, dramatic literary criticism, social, political and cultural studies of theatre and performance, ethnographic explorations of performance traditions, and editorial commentaries on topics related to the performing arts. Plays/theatrical productions/performative practices in which Islam is a significant topic or in which Muslim subjectivities are consciously foregounded. Plays/theatrical Productions/performative practices in which Islam serves as an invisible but crucial component. The impact of socio-cultural and political manifestations of Islam on responses to public performances. The interaction between religion and Arabo-Islamic critical and theoretical writings on theatre and performance. Interviews and profiles on "Muslim" theatre/performance artists (whether or not they would define themselves as such, but with attention to the implications of such religious/non-religious self-definitions for their various public practices). Interactions between Islam and other faiths and/or cultures (particularly via theatre translation); these may include interactions taking place onstage or as performative readings of culture. In addition to the above, the BJTP also seeks book and performance reviews broadly related to the issue topic. Inquiries regarding submission may be directed to the editors, and additional information, including submission guidelines and a style sheet, may be found on the journal's website. BJTP is peer-reviewed and adheres to a blind submission policy. It is indexed by the MLA International Bibliography and EBSCO. I am writing to help generate understanding and support for the importance of the apology that will soon be issued by the new Prime Minister to generations of Aboriginal and Torres Strait Islander people who were forcibly removed from their families under the policies of successive Australian governments. Leaders in all sectors are broadly supportive of the apology as a means of moving the nation forward and creating more respectful relationships between Indigenous and non-Indigenous Australians that are necessary for us to achieve better outcomes and to close the 17 year gap in life expectancy between Indigenous and non-Indigenous children. To maximize this vital, new opportunity it’s important that we all understand the background to the apology and why it’s a good thing for all Australians. THIS SORRY FAQ, prepared by Reconciliation Australia, may help answer questions you have. It’s the start of an important conversation for all of us. Please take a few minutes to read some of the attached material so that you can understand its significance and share pride in this historic moment. PLEASE DISTRIBUTE THIS WIDELY SO THAT MAXIMUM COVERAGE IS ACHIEVED. If you have any questions, you can contact Reconciliation Australia directly on 02 6273 9200. NEW JOURNAL - Coolabah - "This Foreign Country"
Coolabah 1: This Foreign Country is the first edition of the online journal of the Australian Studies Centre of the Universitat de Barcelona (Spain). The RSH builds on research fostered by these Centres and seeks to promote innovative research in the Humanities. Its Visiting Fellowship program is an enhancement of the program offered by the HRC since the 1970s and provides funds to support scholars to work in the Research School. David Morley is Professor of Communications at Goldsmiths College, University of London, where he directs the PhD programme in the Department of Media and Communications. He has held temporary visiting positions at the University of Stockholm; University of Madison-Wisconsin; at Ramon Llull University, Barcelona; and at the Annenberg Centre for Communications, University of Southern California. He co-founded both the Transnational Studies Research Unit and the Pacific Asia Cultural Studies Forum at Goldsmiths. He is the editor of the Comedia book series for Routledge and is on the Editorial/Advisory Boards of a number of journals, including Cultural Studies, The European Journal of Cultural Studies, Television and New Media, and lnter-Asia Cultural Studies. His work has been translated into 15 languages and his publications include Spaces of ldentity: Global Media, Electronic Landscapes and Cultural Boundaries (with Kevin Robins, Routledge 1996); Stuart Hall: Critical Dialogues in Cultural Studies (co-edited with Kuan Hsing Chen, Routledge 1996); Home Territories: Media, Mobility and Identity (Routledge 2001) and Media, Modernity and Technology: The Geography of the New (Routledge, 2006). This is a public lecture funded by the ARC Cultural Research Network. The University of Melbourne is a contributing institution to the Network. In his second book of poems, Andy Quan recounts a series of firsts: first time listening to Joni Mitchell’s Blue, first loss of a friend, first dance with a man. Building on earlier explorations of memory, sexuality, and culture that are the signatures of his best work, Bowling Pin Fire transcribes the arc of one man’s life from growing up Chinese in Vancouver, to seeing the world through the lens of fearless, free-spirited youth, to arriving, as we all must, at the initial cautionary glimmerings of midlife. The rituals and rivalries of grade school, the later experiments with everything new, the close-knit dynamics of family and far-flung friends, the happenstances and fidelities of love, the elation and hangover of travel to unexpected quadrants of the globe all prompt the quality of reflection necessary to the leading of a truly examined, contemporary life. Andy Quan asks of himself and of everyone: how to be fully in and of the moment? Bowling Pin Fire burns not with empty answers but with the good fortune of worldly insight. Andy Quan’s previous books include Slant (poetry), Calendar Boy (short fiction), Six Positions (gay erotica), and Swallowing Clouds, an Anthology of Chinese Canadian Poetry (as co-editor). His poems and stories have also appeared in anthologies, magazines, and literary reviews around the world. Of Cantonese origin, he was born in Vancouver and has lived in Toronto, Brussels, and London. Also a singer and songwriter, he makes his home in Sydney, Australia, where he works on regional and international HIV and AIDS issues. EXPRESSIONS OF INTERESTS are sought for a Research Assistant on an ARC Discovery Project, "The ABC in Asia and its role in cultural exchange (1956-2006)". THE POSITION requires someone with experience in archival document research and data entry skills who can work independently. The duration is for three months with the potential for extension over 6 or 12 months. A full-time researcher is preferred but a fractional appointment may be possible. It is desirable that you will have completed a PhD. The position is based in Sydney with occasional work in Canberra. The Chief Investigator will be based in Melbourne at La Trobe University's Media Studies Program. Remuneration is at Level B1: $67,876 pro rata, (for fractional or part-time). >> See full information at this earlier news-blog post. The city has become central to the ways in which contemporary society is imagined, not only in the industrialised West but in the industrialising economies of Asia. Public bodies utilise cultural activities to promote ‘civic’ identities, and the creative representation of the city to its inhabitants through public and quasi-public events provides a sense of pride in place, tradition, and belonging. Yet as Bridge and Watson have noted: ‘As cities have become more complex, more global, and more diasporic it is harder to construct cultural markers which make for a simple image of the city with which to identify’ (Bridge and Watson, 2000). Visit the conference website for updates! This is the first of an annual free symposium to be held as part of the Barbican London Australian Film Festival. Academic papers on all aspects of Australian film and the Australian film industry are welcome with particular interest on recent film, and work that can contextualise the films in the 2008 festival (titles attached). Please note the symposium will also be open to the general public. All papers will be considered for publication in Studies in Australasian Cinema, an international fully-refereed academic journal. Please direct inquiries to Dr Ian Henderson, Menzies Centre for Australian Studies, King's College London. As part of Sydney’s Chinese New Year Festival External Events, join the inaugural Chinese Australian Women's Life Stories Down Under workshop - be inspired to preserve your life story! Keynote speaker will be filmmaker Tony Ayres, winner of the 2007 AFI Best Director and Best Screenplay Awards for Home Song Stories, which is loosely based on his own life, and takes place at much the same time as the abolition of the White Australia policy. Tony will detail the rewards, challenges and emotions which the telling of a life story brings. The workshop will be chaired by Dawn Wong. A great granddaughter of Wong Sat, she has extensive experience in researching and presenting her family story. A Project Officer is required by the Research Office of the Creative Industries Faculty to assist a Steering Committee in the coordination, development and maintenance of Digital Storytelling and co-creative initiatives at the nexus of research, teaching and engagement. Benefits available at QUT include 17% employer superannuation contributions, a generous study assistance scheme, salary packaging, extensive development and training programs and access to a range of state-of-the-art facilities. Whilst the University welcomes applications from candidates outside the greater Brisbane area, candidates will be responsible for any travel and relocation expenses involved in interview/ commencing appointment. Founded in 1998, The Literary Encyclopedia is a collaborative historical and scholarly project of global ambition which intends eventually to provide a description of all literary and cultural texts of scholarly interest in the English-speaking world, and to provide informed guidance to critical reading, cultural topics and the historical context of cultural production. The Literary Encyclopedia is seeking to extend its coverage of Australian authors, works and topics; we welcome offers from qualified scholars to contribute in any of these categories. The publication is collectively owned by its editors and authors (1600+ and constantly increasing), most of whom are current or recently retired university teachers. The Literary Encyclopedia has already published over 4100 articles and has 870 commissioned for publication in the next 12 months. The publication is supported financially by institutional subscriptions from a growing number of major literature dep artments, and by individual subscribers. The University of Adelaide invites applications for a Professorship in Creative Writing in the Discipline of English. The Discipline has a well-established and successful program in Creative Writing at the postgraduate level, from Graduate Certificate to PhD, and will be introducing an undergraduate stream from 2009. Graduates and students of the program have had very good publication outcomes, and Wet Ink: a magazine of new writing is produced by members of the Discipline. Creative writing staff and students are actively involved in the wider writing and arts community and in the production of literary journals. This position is supported by the Government of South Australia through ArtsSA. The successful candidate will provide leadership in the further development of the Creative Writing program and in its engagement with the wider arts community, maintain a strong public presence as a publishing writer, supervise postgraduate research students, and participate actively in the intellectual and collegial life of the Discipline. The two previous incumbents of the position (Tom Shapcott and Nicholas Jose) have both been distinguished in their engagement with the study and teaching of Australian writing as well as in their own practice of creative work. Further information, including the selection criteria (PDF, 24kB) and information on the Creative Writing program, may be obtained from Professor Nicholas Jose (nicholas.jose@adelaide.edu.au). Receipt of applications deadline: 31 January 2008. In 1993, with an endowment of $500,000 from Dr. Shao You-Bao, the Dr. Shao You-Bao Overseas Chinese Documentation and Research Center was launched at Ohio University Library. The Center has identified the Overseas Chinese communities in Southeast Asia as a priority area, especially for the identification and preservation of manuscripts and printed materials. The missions of the Center are to collect, preserve, and make accessible the manuscripts and published resources by and on the Overseas Chinese. In addition to collections of books and journals, the Center will actively seek to identify, acquire, and preserve manuscripts, archives, and other unique resources documenting the activities of Overseas Chinese. >> Visit the Shao Center. The current listing of Australian scholars in this field can be found HERE. Missing Persons seeks to examine and explore issues arising from loss and displacement, memory and forgetting, disappearance, erasures and caesuras, death and dying in artistic and creative production. In particular the conference will assess the artistic, cinematic, literary, moral, social, familial, (geo)political, philosophical, psychological and religious significance of these issues, both individually and together. Submissions can include papers, performance, art works, installations, works-in-progress and workshops. The conference steering committee also welcomes the submission of pre-formed panel proposals. 250-word abstracts should be submitted by 31 March 2008. If an abstract is accepted for the conference, a full draft paper should be submitted by 31 May 2008. A small number of bursaries will be made available to assist post grad students travelling to the conference from interstate. The Australia-China Council (ACC) is pleased to announce the Australia-China Council Churchill Fellowship for projects undertaken by Australian citizens in mainland China, Hong Kong, Macau and/or Taiwan. The Fellowship is for the investigation of an issue in any field that promotes mutual understanding and fosters people-to-people relations between Australia and China. The Fellowship is open to all fields and no prescribed qualifications are required. Applications will be assessed according to merit. The ability of an applicant to share the results of research undertaken during the Fellowship with the Australian community will also be an important selection criterion. The ACC Churchill Fellowship will involve travel to China of four to eight weeks duration and has a value of around $25,000. This includes airfares and an overseas living allowance. Travel may commence from 1 September 2008. All applicants for the ACC Churchill Fellowship will also be automatically considered for the regular Churchill Fellowships. Applications opened on 1 November 2007 and close on 29 February 2008. The Churchill Trust can also be contacted on churchilltrust@bigpond.com or 1800 777 231. In China, his ninth monologue performance, William returns to a motherland he never knew, a stranger in his homeland. Taking us from the streets of Beijing, where electronics superstores jostle with echoes of the Cultural Revolution and the Ming Dynasty, we travel to the sacred mountain Huang Shan, a must-climb for every Chinese pilgrim-tourist. Part social documentary, part personal observation, China is a journey of reflection about the meaning of culture and belonging, for performer and audience alike. Yang's wryly humorous and sensitive perspective, his eye for detail, and his arresting images come together with Nicholas Ng's haunting live score for the erhu (Chinese violin) and pipa (Chinese lute), in an unforgettable theatrical experience. William also has an exhibition, CLAIMING CHINA, at the Australian Centre for Photography beginning 1 Feb until 8 March (see 2nd item on this page).